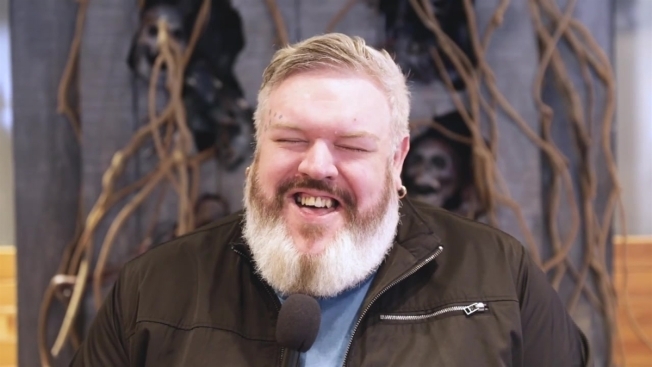 We caught up with actor Kristian Nairn, who played Hodor on "Game of Thrones," ahead of the April 14 premiere of the eighth and final season of the HBO show. Nairn was in Boston on Tuesday to greet fans at the AT&T Flagship Store on Boylston Street as part of the store's immersive "Game of Thrones" experience. Q: Who do you think will take the Iron Throne? A: That’s not a simple question. I think with "Game of Thrones," like everything, it is not going to be as simple as that. I don’t think it will be just one person. I don’t know, something mad has to happen, like the throne will be melted down or blown up or something. I don’t know, someone will sell it on eBay. Something more complicated has to happen. "Game of Thrones" is never simple. However, if I had to pick one person on the throne, I would pick Brienne of Tarth on the throne. Q: Do you get tired of people asking you to hold the door? A: Well it just happened about 30 seconds ago. We had a “hold the door moment” in the elevator about 30 seconds ago. It happens every day and I just live for it (said with sarcasm and an eye roll). Q: As a gay man, what do you think of the show’s portrayal of gay characters? A: I was really glad that there was some in there. I was also glad they weren’t really stereotyped. Like, the Knight of Flowers was badass, you know, he was one of the best warriors in the kingdom. I would have liked to see more in there, but it was a really good depiction. Q: Since you are a DJ, what would you have played at the “Red Wedding”? A: Probably "My Heart Will Go On" by Celine Dion (laughs). That’ll finish everyone else off. Q: What "Game of Thrones" character would you like to kill off? A: Meera Reed. Because if she hadn’t told me to hold the door, I’d still be there.